For visitor information, visit Friends of Point Prim on Facebook. Digby Gut. 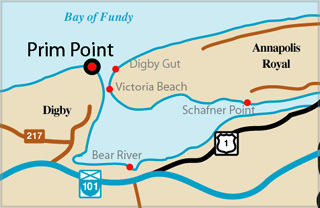 - Point Prim (Prim Point), a rocky headland, is the west entrance point for Digby Gut, the deep water passage, 0.4 mile wide, between high steep shores, which leads to Annapolis Basin. Lights. 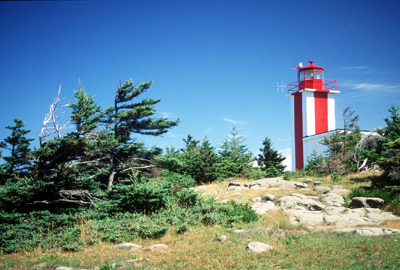 - Point Prim light is shown from a white tower, with red vertical stripes, on the corner of a square building situated on the point (44.41 N, 65.47 W). Digby Gut light is shown from a skeleton tower, 24 feet (7.3 m) high, adjacent to a white building situated on the east side of the entrance to Digby Gut (44.41 N, 65.46 W). Fog signals. - A signal of one blast every 30 seconds is sounded from the Point Prim light building; the horn points 318 deg. A signal of one blast every 15 seconds is sounded from the Digby Gut light building; the horn points 337deg. Light Height: 076ft feet above water level. Tower Height: 025ft feet high. Light Height: 080ft feet above water level.